This is a little off topic but I bought another bike yesterday. It's sort of a CBR having the Fireblade engine so hopefully I will get away with being off topic. 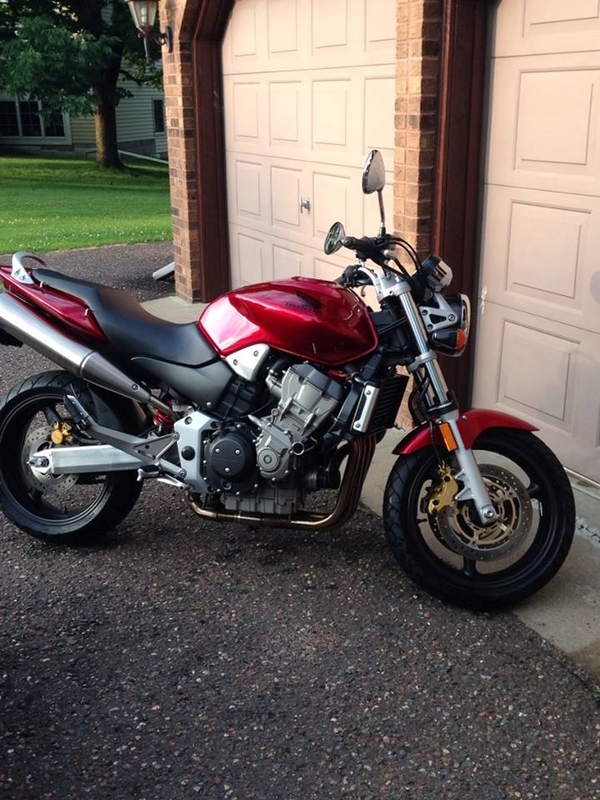 I've been looking for a nice one of these for a while since Honda quit selling them in the US. It's a 2007 Honda 919 "Hornet". It has 6000 miles on it and is like new. I got a really good deal on it, and having sold one of my trikes had a little money to play with. The 919 has a detuned 919 engine with different valve timing and smaller FI throats to give it more lower and midrange punch to make it more versatile for different uses. It can be a commuter or a rocket...and everything in between. 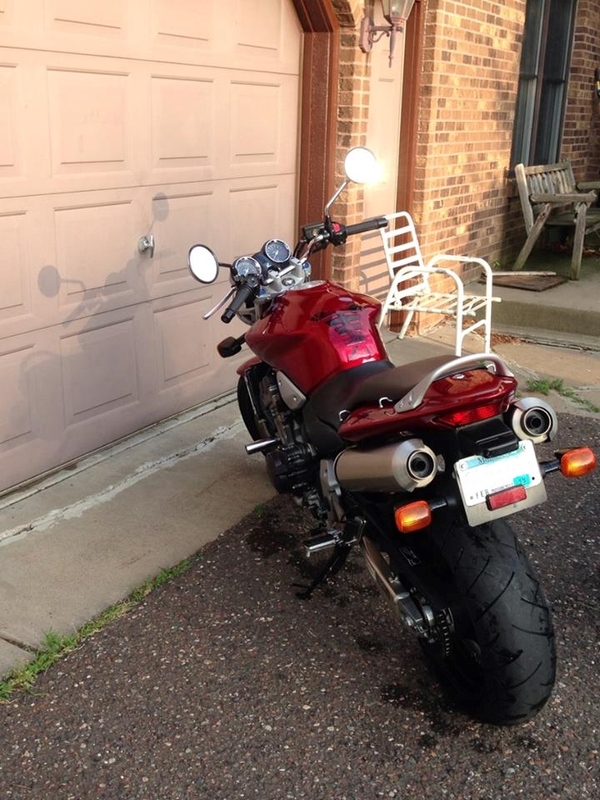 Has an upright riding position which I wanted since my back is bad. I've only ridden it a little bit because it's raining today. It's an awesome ride. Got to ride the 919 today. Wow! So smooth. This is an amazing bike. Very easy to ride. Like the upright position. Pretty much just what I was looking for, although it has some mean low down torque...wants to go right off the bat. I'm trying to take it slow but the bike doesn't want me to. Very nice.. I am really starting to like that style of bike with the sportbike engine & upright riding style. Was looking at the FZ1 & SV1000, but I don't think I need that much power on tap I'm not very good at keeping out of the throttle on bikes like that! I had forgotten about the Honda, and the power is a little more mild while I'm sure it still gets up and goes in a hurry. I've been studying this class of bike for a while and you are right about the FZ1 and SV1000 having more power but they end up acting more like a sport bike which I wanted to avoid...higher RPM is not an advantage if you want the bike to be more versatile. I think Honda hit the mark but buyers didn't get what they were trying to do. Low end and mid range torque on this bike is what makes it a bike you can commute on and can be fun too. It's got plenty of guts and it's down right scary when you hit the throttle hard. It will lift the front wheel easily. So far I have been really easy on it but can feel that it has real power there on demand. It has a smooth power band that is there on the ready at any speed. Everyone said it was an awesome bike and owners rave about it. They can be had used for not a lot of money...the fun factor is there and it's a Honda. Those are brilliant. The great thing about them is that you can easily modify them to take some of the CBR parts that you might want - like suspension and brakes, but you can keep the linear motor and comfy ergo's. Yes...you get it Conrice. For some reason US buyers didn't understand this bike...or Honda was ahead of the curve particularly with the linear motor...that's pretty much what killed it here. People thought it dumb that they took away the top end of the Fireblade...but that's what it took to get the low and midrange torque. I love the power curve and response. You don't need to rev it to get going...just go. I'm not sure about the 17" front wheel on the earlier ones, but this one has 17" front and back. We call it the Hornet here also but Honda couldn't use the name here because Chrysler owned the rights to it. Yes a fuel gauge would be nice but not mandatory. There is a center stand I can get from Honda for it. Got some more seat time on it and just love this bike. It is easily the smoothest ride I've ever owned. Just a really nice bike...puts a smile on my face. Wires smoked now no lights no start!